For a guy considering a run for the president of the US, billionaire and former Starbucks CEO Howard Schultz has gained little traction. 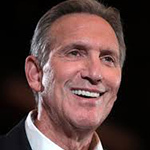 His splashy Jan. 27 "60 Minutes" announcement that he would run as an independent candidate may very well turn out to the high water mark of the Schultz for President campaign. It has been downhill since for the life-long Democrat Schultz. His independent presidential ambitions have been roundly criticized as Trump's ticket to re-election. It's telling that Schultz's biggest media supporters are the gang on "Fox and Friends," the president's favorite TV program. A fellow "person of means," which is Howard's preferred term for a billionaire, Mike Bloomberg, wrote that an independent run "would just split the anti-Trump vote and end up re-electing the President." The ex-NYC mayor, who had considered a third-party run for the White House, knows what he's talking about. He blogged on Jan. 28: "Now I have never been a partisan guy — and it’s no secret that I looked at an independent bid in the past. "In fact, I faced exactly the same decision now facing others who are considering it. The data was very clear and very consistent. "Given the strong pull of partisanship and the realities of the electoral college system, there is no way an independent can win. That is truer today than ever before." Bloomberg is now considering a run as a Democrat. A CNN poll released Feb. 7 shows that voters are not exactly jumping on the Schultz bandwagon. He ranks last on the 11 candidates or potential candidates considered by CNN. A mere one-in-five of respondents say they are either "very likely" (four percent) or "somewhat likely" (16 percent) to support Schultz. That trails second-tier politicos Ohio Sen. Sherrod Brown (21%), New York Sen. Kristen Gillibrand (22%), Bloomberg (27%), ex-Rep. Beto O'Rourke (29%) and New Jersey Sen. Cory Booker (29%). Former VP Joe Biden (50%) tops the list, followed by Trump (41%) and Sen. Bernie Sanders (41%). Schultz may see the writing on the wall. During a Feb. 7 speech at Purdue University, where he received an underwhelming reception, Schultz promised once again that he would not play the spoiler role in the presidential race. "No one wants to see Donald Trump fired more than me," he said. The Starbucks chief should take time to smell the coffee and drop the independent run. That would allow him to focus on promoting his new book, "From the Ground Up," which may have been the reason why he threatened to toss his hat into the ring in the first place.